If you want a memorable experience that provides adventure, nature, horseback trail riding miles from the nearest neighbor, and unparalleled peace and quiet, then read on about this highly recommended trip. 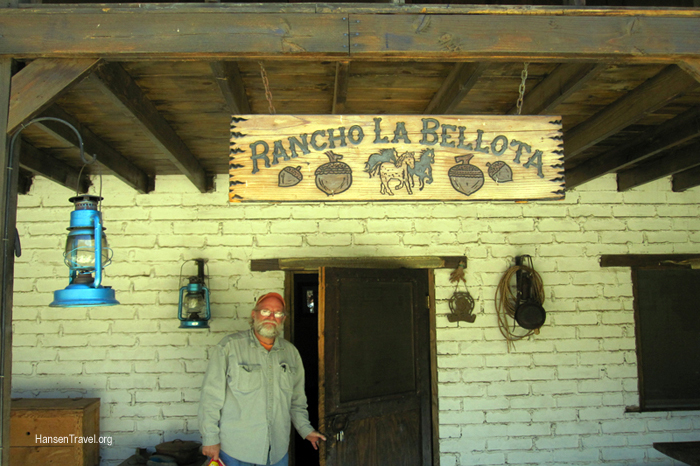 My old friend Jim Berrian made me an offer I couldn’t refuse: He invited me to spend the day at his friend’s secluded Baja ranch, called Rancho La Bellota, and go horseback riding through the mountainous trails tucked away in the heart of Baja California, Mexico. I must confess, as I told Jim, that I am not experienced or comfortable with horses. 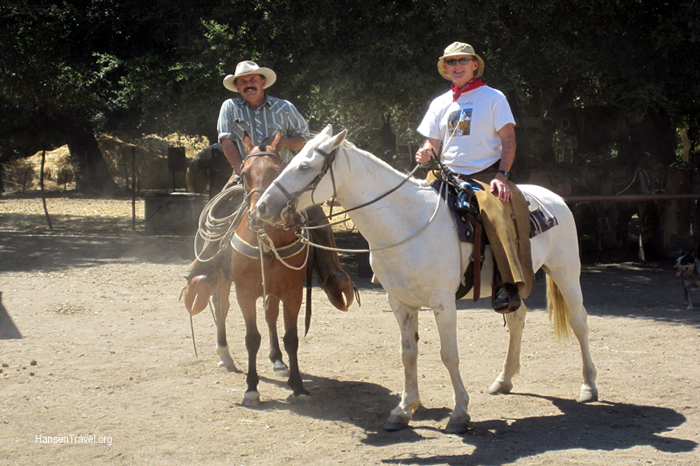 He reassured me that these horses were easy to ride and the ranch was worth getting to know. Turns out he was absolutely right on both counts. We passed through the US/Mexico border at Tecate, which is much smaller and easier to handle than bustling Tijuana. After maybe an hour, we turned off the highway and headed through a wide agricultural valley until we reached a gated road that led into the distant hills. My curiosity grew as we bumped along the dirt road, past scrub brush and soaring hawks, and when we crested the top of the hills, I spotted in the distance a cluster of white buildings. We parked by the corrals, walked over to the horses where Jim patted his horse, happy among the 25 other horses, and then showed me around the compound. 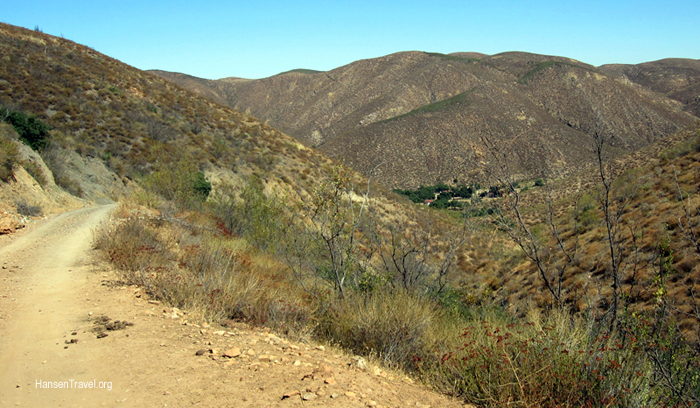 Rancho La Bellota is a unique place about 45 miles from the U.S. border: It consists of 2800 acres of unspoiled Baja hills and valleys with only a few dirt trails indicating a human presence. The four guest rooms surround a sparsely planted courtyard leading to the kitchen and dining area. Each room has two double bunk beds, bathroom with hot & cold water, toilet and shower. In the winter, there’s a wood burning stove for heat. Light is provided by kerosene lanterns and candles because there’s no electricity. I hope this doesn’t scare you off because when I spent a year traveling through Asia, my fondest memories are from the places in Bali and Nepal that used kerosene lanterns at night, which created the utmost peaceful and romantic settings. The owners, Raul & Caroline Aguiar, are gracious hosts, known for their good cooking but renowned for their horseback riding adventures. After lunch we headed for the corrals. I was nervous about this horseback riding idea. Last time I rode a horse, when I was young and living in Arkansas, the horse in front of me kicked my ankle and my horse was determined to rub me against the barbed wire fence. Never felt drawn to horses after that. But here’s the amazing part: I loved my trail riding experience. These horses were phenomenal. My horse moved left or right immediately when I touched the reins to the proper side of his neck. He stopped immediately when I gently pulled on the reins. I was simply amazed and relieved that I, the least capable horseback rider, was able to so thoroughly enjoy this novel experience. While riding the trails I found myself fantasizing about being a cowboy roaming the Wild West on my trusty steed. So as we plodded along the rocky hillside dirt trails, my confidence and enjoyment grew by the minute. We traversed hills and valleys that no normal horses could handle, yet these backcountry-studs handled it with sure footed grace. I really did feel confident about my horse, but just for the heck of it I asked Jim if the horses ever stumble or make some mistake while navigating these narrow, rocky trails hundreds of feet above the valley below. “Nope. They were raised here and all their lives they have learned how to handle this kind of terrain. No problem for them,” he replied. Our ride lasted a couple of hours and I enjoyed the experience so much that I made up my mind to come back here someday with my wife and spend at least a couple of days. 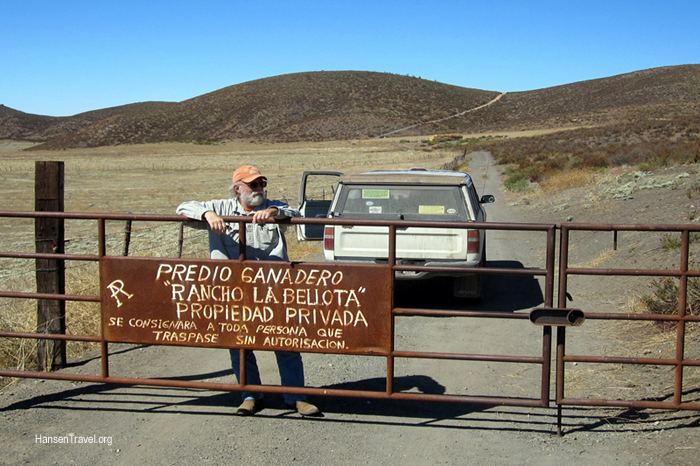 My overall conclusions about this remote Baja ranch are as follows: If you like horseback riding, especially on wilderness trails, you will be in heaven here. Forget the Mexican drug war stuff, this area is completely safe; in ten years, Raul and his wife have had zero problems. They will pick you up and return you to Tecate, so you don’t have to deal with driving in Mexico if you don’t want to. There’s no problems with the food, unless you consider gaining weight due to eating too much delicious home cooking a problem. The accommodations are modest, but OK. Imagine how special it is staying far from the noise and light pollution of our civilization. Reading, writing letters, having a cool drink or whatever else happens by kerosene lantern is a rare treat to savor. For the adventurous, nature loving, horse riding person, this place should be on their list of “must do at least once in my life”. How to get to the ranch: 1. 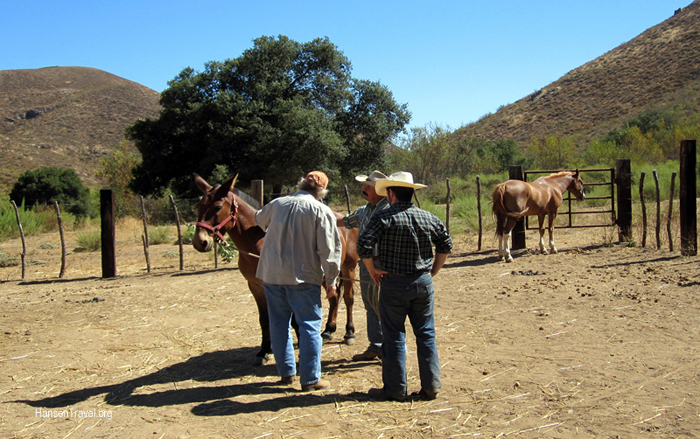 Arrange free transportation to / from the ranch with the owners. 2. If you want to drive yourself: From San Diego County make your way to Hwy 94 and cross the border into Tecate. Go straight to the first signal light at the town plaza. Turn left to go by the plaza and turn right at the next light. Go past the McDonald’s and continue straight ahead. You are now on Mexican Hwy 3 towards Ensenada. Take this out of town and your will cross under the Tijuana-Mexicali Toll Road (Cuota). Within a quarter mile you will see a Pemex and Circle K store (the Circle K is a good place to exchange dollars for pesos, use the bathroom and get a snack). Continue South on the highway passing through Valle de las Palmas and Testerazo. After Testerazo there is an open valley, Vallecitos, after which the road will wind through some hills. The road straightens at Ejido Ignacio Zaragoza. Turn left on a dirt road at the bus stop shelters, pass through the village, and continue on this main dirt road for nearly 11 miles to the ranch. There are a couple of signs for La Bellota. Stay on the primary dirt road and you will be fine. You will pass through an olive orchard bordering both sides of the road, a reservior on the right and the greenhouses of Ejido San Marcos on the left. At about 10 miles you will come to a solitary house and a sign for La Bellota indicating a right turn. Very shortly you come to a gate. Go through the gate, but if you found the gate locked, undo the simple seat belt lock and re-lock it after passing. You will drive past vineyards on the left and then come to another gate. This is La Bellota. Pass through, close and latch the gate. Continuing on the dirt road you will pass some fenced pastures then the road will climb, level off, then drop after driving under the La Bellota welcome sign. 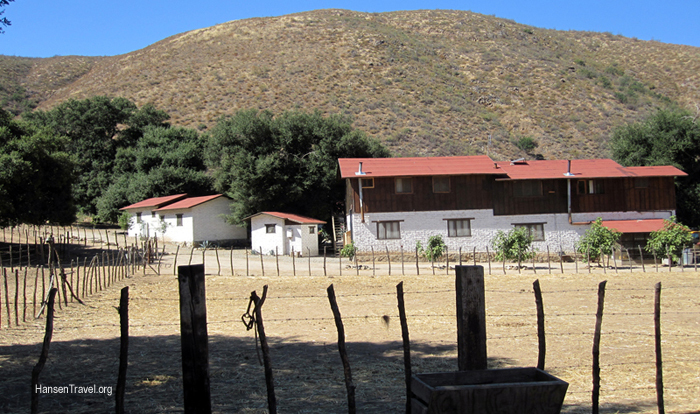 Follow the road to the ranch compound and park in front of the 2 story dwelling. A passenger car will work, but I was glad my friend drove his small truck. Rooms and Amenities: Only four rooms, so it is a cozy, intimate place to stay. Each room has pretty basic bunk beds and bathroom with h/c running water, flush toilet and shower. Wood burning stove for heat. Kerosene lamps and candle for lighting. Rates: Depending on the kind of ride you want to do, the most common package is to go down Thursday eve, ride Friday and Saturday, return Sunday; this includes 8 meals, tack, horse rental, guides, lodging. Rate is $375 per person with a group minimum of 6. 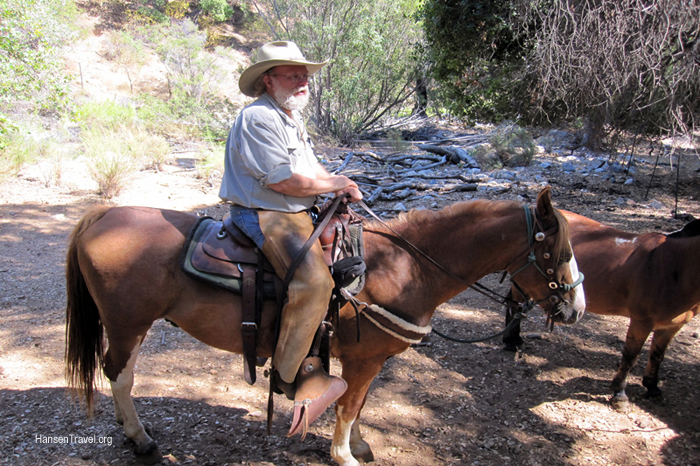 Customizable horse riding options: Here’s how my friend Jim describes it: “They do offer a variety of possibilities depending on desire, ability, and physical condition. (I have done all their rides and I am no athlete). There are options to do a Friday-Sunday ride; Thursday-Sunday ride; Gold Mine ride (4 days); a 5 hour one-day ride; a couple of 10 to 12 day rides with one eve to prep and one morning to recover. We’ve done some long pack rides into the Sierra Juarez mountains (one was for 6 days and the other was for 8 days). 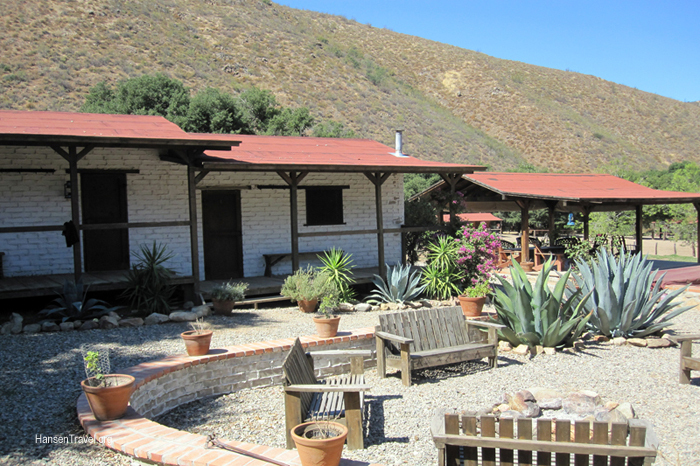 There’s also a trip from Ensenada that some folks have arranged for a week to mix hiking, riding and relaxing. 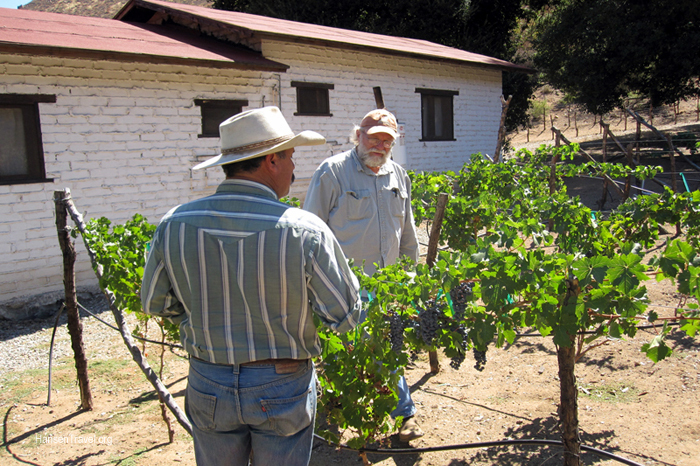 Another group arranged a few days to stay at the ranch and Raul drove them to visit various wineries. Bottom line, visits of a few or more days can be arranged and tailored for a particular group. A short ride would last a few hours over a 4-5 mile easy ride. Scenery is ranchland and chaparral wilderness. A day ride could be few hours out, lunch under oaks, and back. Costs vary by length of stay and activity. Things to do besides horseback riding: Hike, relax, do photography. The ranch is an official birdwatching and quail hunting destination. Bird watching can be arranged ahead of time and an ornithologist is brought out to lead the hikes. Safety concerns: There is no reason to be worried about going to this ranch from a safety standpoint. You’re dealing with rural Baja, Mexico where people are polite and welcoming. All they want from you is courtesy and respect, and you’ll get back the same. Obey the laws, don’t antagonize the authorities, and use your common sense just as you would in the USA.